News - Amy Winehouse documentary prompts important question - are we protecting our pop stars? Amy Winehouse documentary prompts important question - are we protecting our pop stars? There’s an especially harrowing scene in Asif Kapadia’s new Amy Winehouse documentary where the singer skips onstage to greet a booing audience in Belgrade, Serbia. An hour late, she stops to talk to her band before sitting on a speaker, staring blankly into the crowd with her chin resting on her hand and refusing to sing. “Sing or give me my money back,” screams an audience member, filming on his phone The date was 18 June 2011; one month later, after years of struggling with drug and alcohol addictions, an eating disorder and depression, Winehouse died in her Camden home, of accidental alcohol poisoning. That Winehouse continued on in such a state speaks volumes about the pressures inherent in pursuing a career as a musician, whatever your apparent level of success – pressures that are rarely discussed, but which the film Amy brings into focus. Newspapers like nothing better than to zone in on our pop stars’ frailties, from close-up shots of the remnants of a cocaine hit in Pete Doherty’s nostril to headlines trumpeting Susan Boyle’s emotional breakdown. But what about considering the background to them. 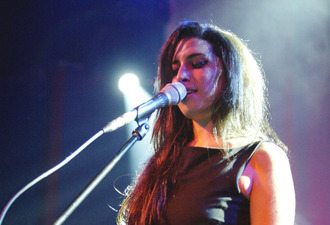 In some respects, the pressures placed on artists are only intensifying: in the four years since Winehouse’s death, sales from recorded music have been slowly dwindling, as the music consumer moves from parting with £10 for an album, to streaming it for free, meaning artists, labels and publishers receive a fraction of the royalties they once did. According to The International Federation of the Phonographic Industry (IFPI), overall global revenues of the recorded music market have declined 7 per cent since 2011, down from $16.2bn to $14.97bn in 2014. Is stress amongst musicians more evident as a result? Korda Marshall, founder of indie label Infectious Music and a prolific A&R man, who’s worked with acts including Alt-J, Take That, and Madonna, certainly thinks so. “There’s a lot more pressure now. The value chain has switched from the CD and the consumption of music more to the live environment, where fans want to see the artists. That’s brought more money into the arena business and the pressures there are huge,” he says. Indeed, with the increased emphasis on live revenue, the physical toll on all artists has increased, whether they’re playing clubs, theatres or arenas. Making sure young artists get eight hours’ sleep, eat well, and are in bed by 1am while on tour, are just a few of Marshall’s rules. “You have to make sure the artist is comfortable, whether that’s [allowing time for them to sleep] during the day, booking a hotel room at night as well as a tour bus so they’ve got the option of carrying on with the journey or staying where they are.” The advice is mirrored by mental health charity Mind, who say it’s the manager’s responsibility to make sure artists are working in a healthy and safe environment. Which isn’t as obvious to everyone as you may think, according to Marshall. “There has been a lack of good solid experienced management in the UK. What has happened is, a lot of managers have become facilitators, so they facilitate what the musicians want to do, organise it and coordinate it. In the olden days, [the approach] was the manager was the boss, the man [or woman] who managed the situation and controlled the artist. That happens less and less these days.” That certainly seems to be the case with Winehouse, for as her career took off, Shymansky – who’d been a close friend from the age of 16 – was out of the picture, replaced instead by Raye Cosbert, a man who’d spent his career organising and booking tours. And then, less tangibly, there’s the increasingly inhibiting ordeal of modern celebrity to contend with; a running theme throughout Amy is the incessant hounding of her by the press – shoving cameras through car windows, and glamorising her destructive relationship with ex-husband Blake Fielder-Civil. In dealing with this, there’s a fine balance to strike. “Cocooning” the musicians is a tactic Marshall’s often used, keeping his artists away from the finer details when deciding what opportunities to take so they can focus on performing and being creative. However, cocoon the musicians too much and you risk alienating them. The most notorious example of that, as Marshall points out, is Michael Jackson. Finally, though pop has always been a precarious career, the turnover of artists has become ever crueller. Year on year, the amount of acts breaking through has dramatically reduced. President of Island Records, Darcus Beese, says that 10 years ago, around 25 acts would make it into the mainstream music scene in a calendar year via a hit single and substantial radio play; last year it was down to three. However, the amount of new bands that indie and major record labels sign is “shockingly” high. “There’s a lot of white noise out there. You put the amount of bands that are signed together with people independently clogging up online, and that’s hard to cut across,” he explains. This knowledge can prey on young artists: when appearing on The X Factor in 2012, singer/songwriter Lucy Spraggan suffered anxiety, paranoia and depression. “There’s always the wavering thought of, ‘What happens if people stop liking you, or you do the wrong thing and then your career is over?’ There is lots of pressure and it’s fast moving, you’re the news one day and chip paper the next,” she says. At charity level, there have been efforts to increase the support available for musicians suffering with mental health issues. The Musicians’ Benevolent Fund rebranded as Help Musicians UK last year in an effort to create more awareness of the diverse range of services they offer, and the British Phonographic Industry (BPI) has been working with them to help raise their profile; the charity is also about to begin more detailed research into mental health, including performance anxiety. Meanwhile, the Musicians’ Union works with the British Association for Performing Arts Medicine (BAPAM) to give its members access to mental health specialists. Rita Ora wants to collaborate with Zayn Malik. Iggy Azalea has insisted she never meant to criticise Britney Spears when she complained about the lack of promotion for their joint single Pretty Girls. Kanye West at Glastonbury 2015, review: Daringly confident performance wins over the fans. There’s an especially harrowing scene in Asif Kapadia’s new Amy Winehouse documentary where the singer skips onstage to greet a booing audience in Belgrade, Serbia. Rapper DMX has been arrested for failure to pay child support just as he was about to perform at Radio City Music Hall. Kanye West at Glastonbury 2015: Comedian 'Lee Nelson' invades stage during headline slot. Kurt Cobain's death should be reinvestigated, says former Seattle Police chief. Fans have been pitching up at Glastonbury, which is celebrating its 45th anniversary this year. It may be almost as iconic as the Pyramid Stage itself, but the Somerset Cider Bus almost failed to make it to this year's Glastonbury when it broke down on route.